"Fruity goodness for smoothie lovers!" 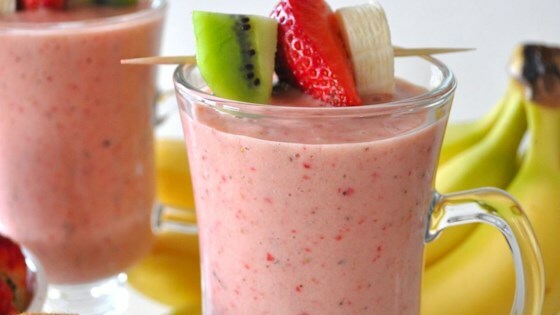 Place the banana, strawberries, kiwi, vanilla frozen yogurt, and pineapple and orange juice blend in a blender. Blend until smooth. I did not like this it had a bitter taste. My husband really enjoyed it and drank mine. I changed the recipe a little by using frozen bananas to give the smoothie a nice texture. I also used half the yogurt then it said too. The smoothie turned out great. I wasn't able to use kiwi's, but it's good, none the less.